Do You Live For Food? Breakfast is your reason for getting up in the morning. But when you’re eating breakfast you’re already thinking about what to make for lunch. Your favourite form of entertainment? Forget action movies, it’s got to be watching a spoon shatter the caramelised crust of a creme brûlée in a slow-motion explosion of sugar and custard. Your most memorable weekend? That time you found a huge bag of perfectly ripe organic avocados at the farmer’s market. Because, guacamole. Enough said? 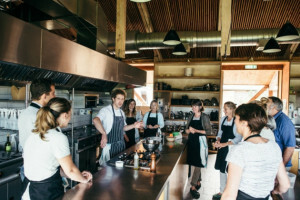 If you live for food and love to cook, then you must experience this cookery course at the rustically beautiful River Cottage. Made famous by the Channel 4 TV series, River Cottage is home to Hugh Fearnley-Whittingstall, one of the UK's most beloved cooks. 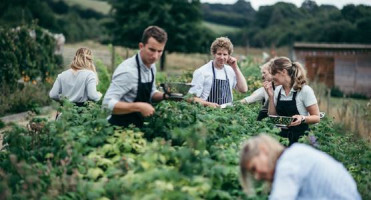 What Makes This Cookery Course at River Cottage Special? Your day starts with a tractor ride to the farmhouse for tea, coffee and treats. From there you’ll delve into a day of culinary heaven, with five different cookery sessions including bread, pudding, meat, vegetables and fish. Whether you’re a seasoned chef or a newbie whose only skill is setting the kitchen on literal fire, you’ll learn plenty of tricks of the trade and emerge from the course as a better, wiser, more knowledgeable cook. Whether you’re a seasoned chef or a newbie whose only skill is setting the kitchen on literal fire, you’ll learn plenty of tricks of the trade and emerge from the course as a better, wiser, more knowledgeable cook. All you need to bring is your passion — and a little bit of hunger. Click the link to book in now! Rustic beauty of River Cottage.